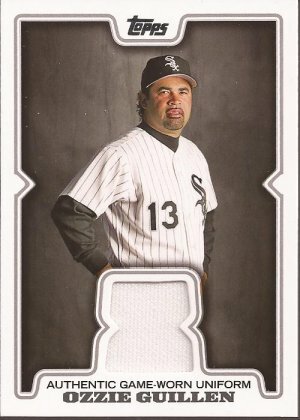 So as I starting talking about a month or so ago, I am working on sorting the volume of White Sox cards I have received in trades (by request) to determine what I have and need with regards to team sets. Currently, I am sorted through the 90's, for the most part. And I add "the most part" only because I found yet another stash of Sox in a box. But not too many 90's, more 00's. Yet still, I need to get them together. Also, it doesn't help the organizing when I receive yet more White Sox in envelopes. That is not a complaint, mind you, but a simple statement. I quick glance at the last couple of packages not only brings a smile to my face to have received them, but also because I am fairly certain they will not duplicate cards in my Big Sort pile. Plus, there were some mighty fine cards received. So why do I lead of with as far away from a White Sox player as possible? Now, it's not to gain favor with Night Owl, Plaschke, GCRL and the host of other Dodger bloggers out there. Should I have needed to have them like me, I have other ways. No - Mr. Billingsley completes 2013 Topps Series one. That little card came from Richard at Dawgbones. Rich jumped on my mini extras for his set building, and we worked out a nice little trade. I was able to work through my dupe box and help with a bunch of team sets. 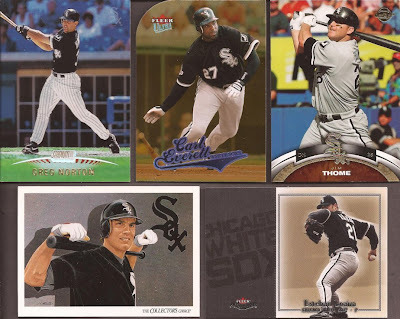 In return, he dropped on my some 2011 A&G, a few Kimballs and a nice assortment of White Sox. Those Stadium Club most have about 30 coats of gloss on them. But all cards I don't have. And the highlight of the envelope. Love him or hate him, Ozzie did get me to see a World Series champ before I died. Plain white, but plain awesome and a great add to my binder. Check Rich out and work out a trade - easiest thing you will do all week. 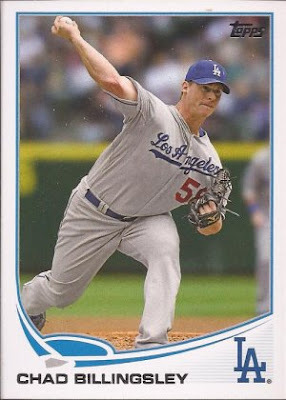 A couple days after Richard's envelope arrived, the Night Owl dropped another PWE on me. Seems to be a Pony Express trail between NY and IL with the small mailings we make back and forth. Greg matched up the Ozzie with this card. While N.O. may not like relic cards, I love getting one, and a card with a Thome is a bonus. For those that know the Owl, what would be an envelope without one of these. That's right - REEEEEEEEEEEEEEDDDDDDDDDDDD LEEEEETTTTTTTTTTTTEEEEEER VVVVVAARRRRIIIIAAAAAAAATTTTTTIIIIIIIOOOONNNNNNNNNNNT! Of course, I mean the 75 mini. I own two - both supplied by Greg. And yes - he added the red back variation card. Thanks as usual, Night Owl. I love Ozzie, but probably because I don't know him personally. 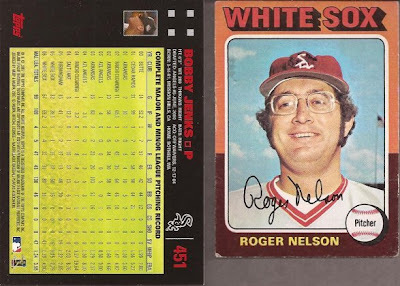 That is a sweet card of his, not sure that I've ever seen a manager relic card. My favorite Elvis Costello song might be "Veronica". Tough call.